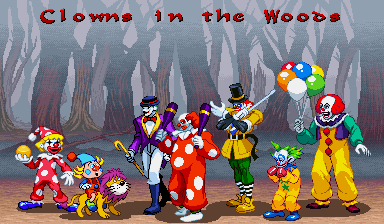 The clowns are still in the woods, but why and how did they get there? 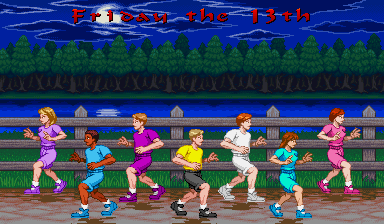 No time to answer those questions now, just run! 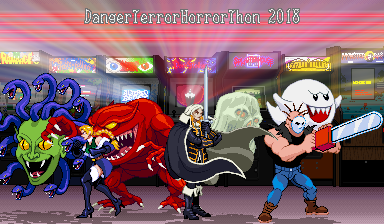 All of the new sprites and that new background were added to the the fighter-scale image generator, where you can make graphics like the one at the top of this post!The sale on line art and pixel art prints is still going on, too! 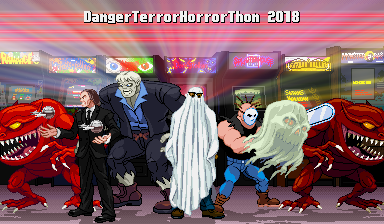 Tomorrow’s the last day of the HorrorThon for this year and there is no theme. Anything is possible. 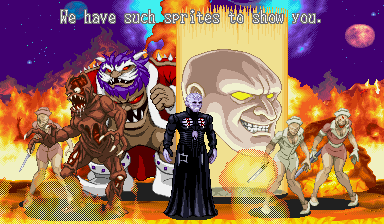 Come back to see who shows up! 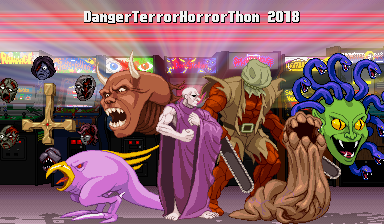 Five days of horror begin here! 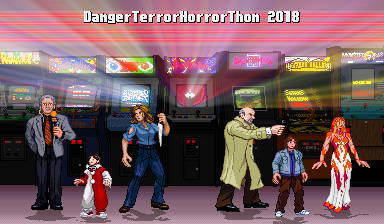 The DangerTerrorHorrorThon 2017 begins with sprites from a game that’s been requested for a long, long time. Finally, IT’S TIME TO HUNT. 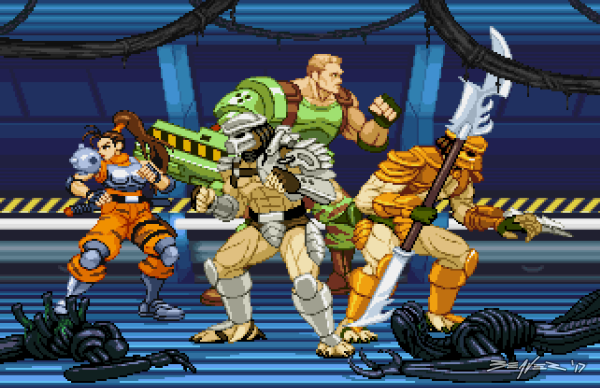 All-new fighter-scale sprites of Lynn Kurosawa, Dutch Schaefer, Predator Warrior, Predator Hunter and Alien Warrior have been added to the new Aliens vs. Predator gallery. Mini-logos for Alien, Predator, and Alien vs. Predator have been added to the movie mini-logo gallery. The Alien Stalker’s standing anim and a sprite of an Alien Defender were added to the AvP game sprites gallery. 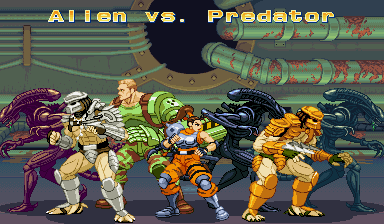 All custom sprites and mini-logos have been added to the fighter-scale image generator, along with a new AvP background based on stage 2. 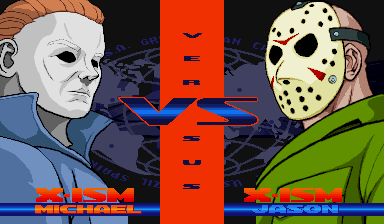 The “Group 384×224 w/ writing” now has the 16 x 16 AvP arcade font, too. 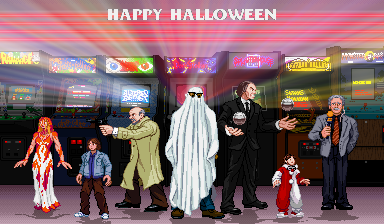 From now until October 31st, all horror-related prints are on sale! 8×10 and 8 1/2 x 11 prints are $5.00 each and 17 x 11/14 x 11 prints $8.00 each! 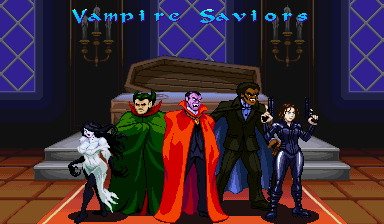 The horror continues this Saturday with an update themed around the living dead! 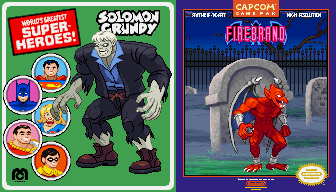 Arcade Quartermaster just dropped an update with four new coin-op shrines: Schmeiser Robo, Superior Soldiers, Dragon Master and (perfect for the season) the Real Ghostbusters! 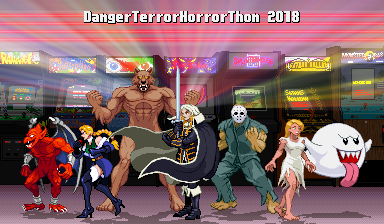 Prince of the Iron Fist will be playing Data East’s cult-classic beat ’em up “Night Slashers” this Friday night, so tune in there if you want to see zombies get pummeled to pieces! Did you think you’d have to wait until Sunday night to get your zombie fix? Never fear (unless we tell you to do so), because we’re here for you. 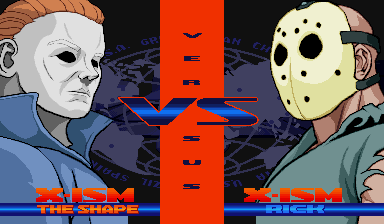 – Data East: Zombie from Night Slashers. 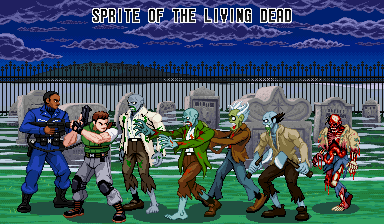 All of those new sprites, mini-logos and a new graveyard background were added to the GFX Generator, where you can make your own zombie or non-zombie horror (or non-horror) screens and graphics.